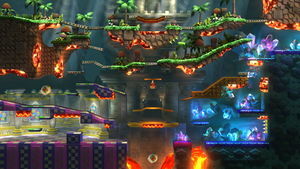 The Great Cave Offensive as it appears in Smash. The Great Cave Offensive (洞窟大作戦, Great Cave Offensive) is a stage that appears in Super Smash Bros. for Wii U and Super Smash Bros. Ultimate. It was revealed, apparently unintentionally, on the official Smash Bros. Facebook page on October 5th, 2014, and then officially confirmed and named during the October 2014 Nintendo Direct. This stage is extremely large and complex, being the Largest stage in the series; it’s size comparable only to Palutena's Temple, due to having been designed specifically for 8-Player Smash. All the blast zones are accessible, albeit only in specific spots, and the side ones can be walked off. However, they are not the only way to KO an opponent due to the existence of Danger Zones, pools of lava spread throughout the stage which instantly KO on touch any fighter with over 100% damage, dealing 25% damage with heavy knockback otherwise. However, it is possible for a character being launched toward a Danger Zone to tech on it without receiving damage or being KO'd. The spikes which appear under the right side of the largest top platform and in the bottom right of the stage deal 10% damage and decent knockback on contact. Minecarts sometimes appear on the top of the brick platform on the middle right and on the lone floating soft platform on the middle left. When entered by a character - or on their own after about 15 seconds from their appearance - they start going forward, dealing 10% damage to any character they hit. The right one can carry characters beyond the left blast line if not dismounted, while the left one crashes in the bottom right corner of the stage (just below the spikes), dealing no damage to its passengers. The two cannons constantly rotate, not smoothly but jumping between the eight cardinal and intercardinal directions. They work like Barrel Cannons: once entered they hold the character, and once a button is pressed they shoot them in the direction they are pointing at, however characters cannot stay in the cannons indefinitely. Care must be taken not to hit a Danger Zone or a blast line. If the item switch is on, treasure chests randomly appear throughout the map. If hit by an attack they release an item, though they will occasionally explode. 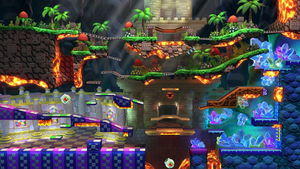 In Super Smash Bros. for Wii U, the Ω form is a single platform different from all the ones in the normal version, mixing the forest area on the top and the crystal area on the bottom right. It is notably the only Ω form to have two different types of terrain, with the grassy side having greater traction than the crystal side. In Super Smash Bros. Ultimate, the main platform of the Ω form and Battlefield form is similar to SSB4's Ω form; however, it is resized and reshaped to match Final Destination and Battlefield, respectively. The three soft platforms of the Battlefield form resemble the soft platforms in the upper portion of the normal form. Examples of the different areas of The Great Cave Offensive as they originally appeared in Kirby Super Star, which include: Sub-Tree (top), Old Tower (middle), Garden (left), and Crystal (right). This stage originates from the sub-game The Great Cave Offensive from Kirby Super Star. In the game, Kirby falls down a hole whilst taking a walk, and he must venture through an expansive cave full of various dangers to escape, while finding as much treasure as he can along the way. The cave is split in four different areas: Sub-Tree (in this stage, the upper portion), Crystal (right), Old Tower (lower middle and seen in the background), and Garden (bottom left). Every area holds several treasure chests, some in plain sight and others hidden within puzzles: they all contain various rewards, and, while all of them are optional, 100% completion requires finding and opening all 60 of them. The four areas are connected to each other by short mine cart sections. Cannons like the ones in this stage appear in the Garden and Old Tower area, forming a maze which Kirby must traverse to proceed. Some of them fire automatically in a fixed direction while others rotate and fire upon a button press. Some parts of the Old Tower area feature patches of lava on the floor and ceiling which act as hazards, dealing damage on touch and are able to KO Kirby if his hit points are completely depleted. This stage is banned in tournaments due to a multitude of reasons including its overly large size which can create camping, disruptive hazards, walk-off blast lines, and being a giant cave of life due to the Danger Zones being techable. The Great Cave Offensive in Super Smash Bros. for Wii U.
Kirby and Pikachu riding on a mine cart. This picture from Facebook was the first hint at this stage's existence. Kirby next to a chest on the top right, with a second chest appearing on the bottom left. Meta Knight getting hit by the spikes in the bottom-right part of the stage. If Wario uses his bike at top speed at the top-middle area and jumps off before he collides with the Danger Zone, the bike will go through the platform and become stuck, so he can never use the move again. The Kirby Super Star Masterpiece starts in The Great Cave Offensive sub-game. For unknown reasons, Lightning Bolts do not spawn on this stage. Its inclusion is said to be based on Kirby Super Star Ultra, the DS remake of Kirby Super Star released after Brawl. Any characters in a cannon will be invulnerable to Timers. When playing as Pokémon Trainer, the trainer will be standing in one of the four sections of the stage, depending on the player's number. This page was last edited on April 16, 2019, at 08:16.